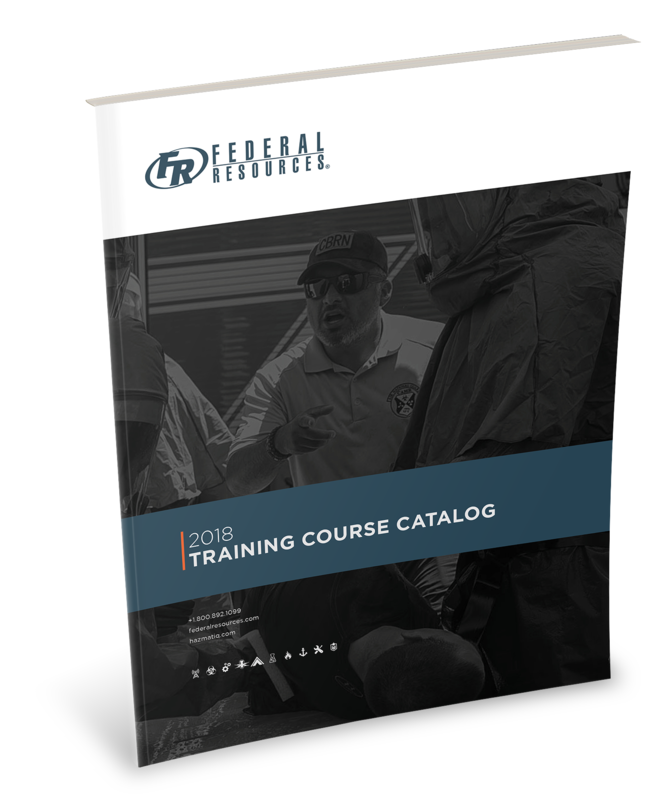 Federal Resources, a global supplier for military and first responder equipment, provides an in-depth, comprehensive learning experience for a variety of professionals and their organizations. The difference? We incorporate valuable classroom time with hands-on training for the equipment you’d use in the field. Trainees can put their acquired knowledge to use and utilize the HazMatIQ Response System to adequately prepare responders on how to deal with threats involving hazardous materials both safely and effectively. Additionally, Federal Resources provides educational opportunities including Hands-On Training, Integrated Chemical, Biological, Radiological, Nuclear, and Explosives (CBRNE) Equipment Training, Explosive Ordnance Disposal (EOD) Training, and Tactical Training. Each training program is designed to be both intuitive and practical, structured in a way that makes concepts easy to grasp and retain. The classroom portion of HazMatIQ training consists of 10 courses, each with a unique focus and objective. In these courses, students learn how to respond to a number of different threats and scenarios appropriately. Federal Resources excels at developing solutions for the mission at hand, whether that is at home or in the field. We support all branches of the United States military as well as local, state, federal, and international governmental institutions. Base networks are always growing to meet the needs of a world more connected with technology than ever. One example of the work being done by Federal Resources in the fight against the drug trade in the United States. The Counter-Drug Training Team includes experienced law enforcement officers from federal, state, and local narcotics agencies; this group monitors the drug trade around the world to look for trends. The knowledge gleaned is built into the DrugIQ courses offered to ensure that trainees are learning the most up to date information to take back to their respective agencies. These courses are easy to use with complete usage guidelines that can be adapted to suit the agency’s needs. Another example is the Army’s Defense Chemical, Biological, Radiological, Nuclear, and High-Yield Explosives (CBRNE) Response Force (DCRF). As the threat of these events grows around the world, Federal Resources trains and certifies many of the soldiers who may be called upon to respond to help save lives in an event involving these threats. With millions of lives at stake, an immediate response will be required. Federal Resources helps make sure those who respond will be ready and that the equipment they have to work with is the best and most reliable available. From the most advanced detection equipment available to respiratory protection to personal protective equipment, Federal Resources focuses on reliability as well as accuracy and precision. Download our 2018 Training Course Catalog (PDF). Who Uses the HazMatIQ System? New Month. New Call. New Threat. New Chemical of the Month. We get called out for a call involving ammonia. You’re the first person there, and you’re ready to go in. But are you? The right gear and apparel may not be what you have. Todd Smith and Milton Painter dive deep into ammonia and tell us the correct response to this threat. Follow along as we run the HazMatIQ system to find out how to assess the threat, determine the chemical, and respond properly.